When ordinary window plate glass is broken, it breaks into angular shards which are very sharp, and can seriously injury someone – not good. 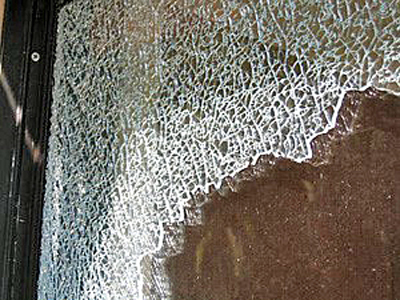 When tempered safety glass is struck, it breaks into small pebble-like pieces (see photo), without sharp edges – a good thing. Safety glass is now required in specified locations in houses including all door glass, most large windows which have their bottom edge less than 18 inches above the floor or ground, windows near doors, stairs and floors, and glass in showers and bathtub enclosures. If you’re buying an older house, The House Whispererinspectors know where safety glass can make a difference in the house. There is no requirement to retrofit these locations, but a greater margin of safety would be achieved by upgrading and installing safety glazing in these areas.